Riftek, the optoelectronic measurement and systems manufacturer has released a new multifunctional software application that utilises its RF625 series 2D laser scanners for automated seam tracking and measurement with welding robots. Available with full support in the in the UK & Ireland from Ixthus Instrumentation - Riftek’s exclusive distributor – the Riftek Lamia software is intended for recognizing, tracking and measuring geometric parameters of objects such as weld seams in accordance with a selected maths algorithm which is derived from a template. The PC based software interfaces to the client robot controller to transmit results and includes data visualisation and the setting and control of the RF625 laser scanner’s parameters. The software was developed with the support of a main strategic partner for Kawasaki and Fanuc robots and various industrial robot communication protocols are included for fast and convenient set-up. 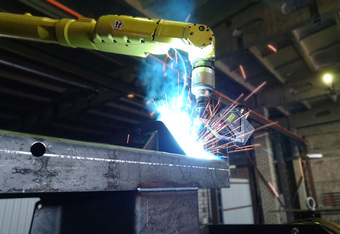 Two sets of ready-to-use maths algorithms for "Welding" and "Measurement" are included that cover recognition, tracking and measurement of geometric parameters of objects in real-time. Automatic recognition of the objects through the RF625 laser scanner in accordance with the selected template is automatic with no need for to measure manually. Riftek’s Lamia software includes calibration of the laser scanner in-situ with the selected robot arm. Riftek’s RF625 series 2D laser scanners include 22 models for high precision non-contact measurements of profile or dimensions for working lengths from 5 to 1400 mm with highly precise linearity and high sampling rates. A choice of red, blue and IR diode wavelengths suit a wide range of materials/environments and furthermore the scanners may be used separately for product recognition or general control. An IP67 sealed aluminium housing and toughened glass faced optics guarantees durability whilst vibration, shock and temperature ratings meet the demands of heavy industrial use. Ixthus works closely with Riftek and supports its full range of 2D and 3D laser measurement scanners and systems which are widely used across general industrial and scientific applications as well as specialist areas such as the railway and transportation industries. For further details on Riftek Lamia software, Riftek laser scanners or other products in Ixthus’ range of sensors, transducers and complete systems for the measurement of displacement, force, torque and vibration, please contact Ixthus on info@ixthus.co.uk or visit www.ixthus.co.uk .